Ms. Farhi has since abandoned that mannerism, but its temporary recurrence on Morning Edition, morning after morning, brought to mind the prominence of the word this, similarly isolated, in the Zen tradition. Generally speaking, in Zen practice this refers to undifferentiated reality, prior to the imposition of conceptual thought. “Just this,” a phrase familiar to Zen students, is what we experience when we penetrate the filter created by dualistic concepts, particularly such ego-centered dualities as “self/other,” “I/they,” and “mine/not mine.” To remain in continuous contact with this, while also questioning its nature, is central to Zen practice. And to lose touch with or misconstrue the nature of this is likely to bring suffering upon oneself and others. In the Vietnamese tradition of Rinzai Zen, as interpreted by the Venerable Thich Nhat Hanh, apprehension of this begins with the cultivation of mindfulness (sati), which Thich Nhat Hanh defines as being present for the present moment. According to classical Buddhist teachings, we can bring mindfulness to any one of four general fields, or “foundations,” of awareness: the body, the feelings, the mind, or “objects of mind.” If we are practicing systematically, we may choose which of these fields we wish to be mindful of, and in what order. If not, we can merely direct our attention to whatever phenomena might arise, moving gently from one to another. What is important is to be present, fully and consciously, whether the object of mindfulness be random or systematically chosen. Continuous mindfulness concentrates the mind. In Thich Nhat Hanh’s words, “[t]he energy of mindfulness carries within it the energy of concentration,” and the two energies work in tandem. When our capacity to be continuously aware has grown strong enough, we can shift our orientation from the practice of mindfulness to the practice of concentration (samadhi), which is based on mindful awareness but differs in several ways. Where mindfulness is inclusive, concentration is exclusive. It isolates a specific object–one component, as it were, of this–and gives that object sustained, uninterrupted attention. And where mindfulness exemplifies “effortless effort,” concentration requires a conscious act of will. In Zen teachings, mindfulness is sometimes likened to a lamp, which illuminates the mind. Concentration resembles a spotlight, which the practitioner trains on a particular object. If, for example, you are practicing mindfulness of your mental states, and you realize you are angry, you can shine that spotlight on your anger. Maintaining your focus on that feeling, you may discern that its immediate cause is a vicious insult vividly remembered. You can still see the speaker’s face and hear his hurtful words. By bringing the energy of concentration to bear upon that incident, you can investigate the causes and conditions which brought it about. At the same time, by remaining mindful of your breathing, your bodily sensations, and your present state of mind, you can protect yourself from merely reliving a painful experience. Should you succeed in this effort, you will have entered the third dimension of the practice, namely that of insight (prajna). Looking more deeply into the remembered incident, you may come to realize that your verbal assailant was himself distressed, and though you were the object of his attack, you were not necessarily its cause. Concurrently, you may also recognize your own role, however limited or unintentional, in provoking the attack. And, most centrally, you may come to see that your present mental state, however solid it may feel, is in reality no more substantial than a passing cloud. In an hour it may be gone. Acknowledging its impermanent nature, you can begin to release yourself from its grip. And over time, if you persist in the practice, the roots of the feeling may disappear altogether. “What is this?” asked the Zen master Bassui Tokusho (1327–1387), enjoining us to pose that question over and again, whether this be an orange, a thought, or a state of mind. Through the practice outlined above, adapted to suit our personal circumstances, we can pursue Bassui’s question, not as an abstract philosophical inquiry but as a means toward stability, clarity of mind, and eventual liberation. And we can learn to live more wisely. Lani- Thanks for your comment. People often find it difficult to distinguish between mindfulness and concentration. 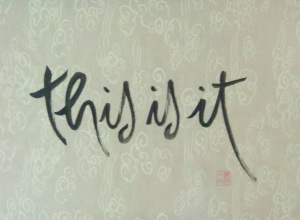 Thich Nhat Hanh’s essay, to which I provide a link, is helpful in that regard.